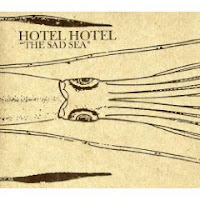 ‘The Sad Sea’ is the long awaited sophomore album from Texas post rockers Hotel Hotel. Formed in 2005, the band released their acclaimed debut ‘allheroesareforeverbold’ before their drummer, and the real force & mastermind behind the bands formation, mysteriously disappeared at La Guardia airport on April 11, 2007; not having been seen since. You might think that this episode cast an aura of disillusion over the remaining members and you’d be right- with the band going on a year-long derailment. A chance meeting with a guy dressed up as a sailor who was on an expedition to discover the real “Marie Celeste” convinced them to sign up to the adventure and glory to be had on the high seas and the rest is history. The ‘Sad Sea’ vividly documents the tale of this fateful voyage from Galveston, Texas to the coast of Haiti during the thick of hurricane season. Sprawling compositions see swathes of acoustic, reverb-drenched ambience form a captivating blanket of sound that washes over the ears with the dynamic buoyancy of a stirring ocean illuminated by moon-light. Patience is the key to carving out an epic and emotionally unhinging soundscape and patience is a quality Hotel Hotel demonstrate in spades. They painstakingly work their instruments up to vibrant crescendos and then reign them back in just as meticulous fashion, but unlike the more popularized chief’s of the post-rock movement that crystallize such bursts of energy within single tracks, Hotel Hotel do this on an album-wide scale. Never brash or hasty, the group perfects the art of elongating tones in a way that wrings out every last drop of emotional resonance. Within such deep and spacious sonic tapestry’s, twinkling melodics shimmer quixotically over a molasses of gloomy deep-set drones, eerie atmospherics and vertebral percussion. After a dreamy start laden with drifting ambience and hazy sonics, proceedings burst into life during ‘Marie Celeste’ as the friction of industrial textures start to engage with ominous atmospheric tones. It is very much like a solitary vessel has journeyed into the deep abyss of the ocean and has been greeted by a storm cloud from which escape is in the hands of the gods. Follow-up, ‘Equator in the Meantime (black Sabbath)’ is testament to the ultra engaging dynamics of Hotel Hotel wherein they form a shroud of melancholic sound in the vein of an opulent Grails meets Explosions in the Sky at their most introspective. A grandiose cinematic swirl is whipped up to envelop listeners like a whistling wind whilst reflective yet haunting melodic tones tinged with a sense of romantic desperation provide a deep and entrancing mysticism. The whole package bobs and sways on a super dense and emotional current that moves across subtle but nevertheless entrancing peaks and valleys. The poignancy of closer ‘the captain goes down with the ship (drowning)’ showcases the crux of the bands abilities to carve out powerful messages through sound. Being a perfect encapsulation of the albums mystical and entrancing nautical theme, the group strike at the very fabric of the anguish and hopelessness of being caught out at sea-weaving through a repertoire of meticulously crafted micro-crescendos in which melodious tones shimmer with a wry energy as deeply textural tones and military percussion play out beneath.